Dark ruby colored liquid, almost garnet. Three finger head of thick tan colored foam. Excellent retention and thick, clumpy lacing. Big dark fruits. Cherries, grapes and figs. Hint of booziness. Caramel malts. Hint of spice. Slight yeast presence. Dark fruits and mulling spices are up front. Plums, cherries and figs. Candi sugars and brown sugar. Slight nuttiness. Mellow yeastiness. Nice undertone of apples. Earthy notes. Very light hops presence. Good medium body. Nice and creamy. Carbonation level is just right. Very smooth. This brew is nice and complex, yet super smooth and easy to drink. Though the hops presence is not very big, there is alot of balance in this one. Just be sure to watch out for that 10%ABV, though. Easily one of my top 5 beers of all time, the St Bernardus Abt 12 is what put me on the map for Belgian beers. I drink it on special occasions usually, and its pretty cheap for the amazingness of the beer. And having the availability it has, its awesome. Well, today marks the special occasion of needing some yeast for a homebrew, and I decided to culture the bottled yeast from this awesomeness. This bottle also has been sitting in the cellar for a year or so getting yeasted up to hell. Also, why not drink it. This just happens to be the first time I'm drinking it while sitting in front of a computer and can log it into BA. Anyways, enough with the Stahlin and drink it already. A: Huge loud pop sound goes the weasel, I mean cork. Steamy mist of Pandora blazes out the top. Pouring into my Corsendonk tulip glass reveals a large 3 finger semi dark head that is pretty thin and full of large bubbles that pop so fast, its down to 2 fingers in a mere 10 seconds! Then leaves an airy pot-marked frothy mess that would make Courtney Love blush!. The light dark colored head is down to a light covering in not time flat! The dark raisin colored brown lets just enough light through to reveal the secret of the Nymph, as well as the huge amounts of yeast and sediment dancing around inside as if they are at the dance, getting prepped to mate soon! N: Yep, thats the aroma all right! Some dark malts, mostly Belgian style, some raisiny fruit flavors, perhaps some fig aromas as well. Some light nuttiness and perhaps cinnamon tickle the nose. However, a touch of alcohol and sweet dark Belgian candi sugars fill out the back bone of the nose. It's not overpowering either. A slight yeast tones down the final touches, but the delicious raisiny Belgian candi sugar and alcohol really just bring the aromas into so much awesomeness. M: Pretty thick and heavy, sweet and syrupy, its almost so thick my tongue is weighing itself down and almost out of my mouth. It's filling up my taste buds so much they can't taste much else after. Then a slight alcohol burn reminds you how heavy the beer is when it comes to abv! Decent carbonation for the bigness of the beer, actually is really high! F: Finishes with a slight sweetness but seems to dry off pretty well considering all the age its had. A slight alcohol warmth and sting singes for a bit, then disappears enough to let you get more of the raisin, cinnamon, candi sugar, molasses, and delicious other flavors. Perhaps if anything, the aging has formed a little too much carbonation. I get some earthy flavors as well, on the finish mostly, I think a product of the yeast turning the Belgian candi sugar into the ginourmous alcohol. Enjoyed this one side-by-side with an '11 Westvleteren XII - thanks to Mike for cracking his open. I've heard from many people that the Abt 12 is the closest (easiest) thing to get to a Westy XII, so I guess we'll see. The pour is certainly a very similar color - brown, copper and murky, maybe a little bit brighter. Unlike the Westy, the Abt 12 has quite a bit of tiny sediment particles. Another big difference is that the head on the Abt 12 is huge, frothy, and has excellent staying power - looks like the froth on top of a latte or something. Whoof, I close my eyes and take a whiff, and honestly, I could have easily mistaken this for another pour of the Westy. VERY similar in the aroma. Huge complexity and just a never-ending array of components: grapes, figs, dates, candied plums, Belgian yeast and spices, brown sugar, molasses, sweet licorice, light bready malts.... Where does it end? It only gets more inviting and more perplexing as it warms up and introduced some new aromas; pecans, light herbal-ness, more earthy tones, fruity esters, mild booze aromas... So far, I don't think I could draw any "major" distinctions from the aromas between Abt 12 and Westy XII. And this was after having them directly back-to-back. Given only one, I probably couldn't accurately discern which was which from the nose alone. At this point, I'm incredibly impressed, and I'm thinking about just copying and pasting my Westy XII review and using it as my Abt 12 review. Just kidding. The mouth feel is similar, though Abt 12 has a bit more of a sharpness from heavier carbonation, as evidenced by the superior head formation. They both share that delectable Belgian-esque creaminess and they are both full-bodied without being too heavy, sticky, or syrupy. I love the silky smoothness that most Belgian quads deliver, and these two beers are no exception. I'm sitting here swishing Abt 12 around in my palate, and I'm almost as amazed as I was when I first tasted the Westy XII - just a huge romp around of seemingly millions of flavors. Candied and sugary fruits, grapes, plums - sweet and pleasing without being overly sugary or cloying. Licorice, toffee, light molasses, Belgian yeast, mild spice, and sweet breadiness from the malt. I can see why people compare this to Westy XII - it's the EXACT SAME THING. In all seriousness, the flavor profiles are eerily similar, but I did notice that the Abt 12 was a little "sharper" and "brighter" - sharper from the carbonation and brighter in the form of softer fruits - I picked up some more definitive apple skin and white grape notes. The Abt 12 also has a touch more of a hop profile, but maybe that's because the Westy XII was a year older? This gave the Abt 12 a bit more bitter leafiness with the bread, butter, and slightly boozy aftertaste. Wow... Wow, wow, wow. People weren't lying. The Abt 12 really is ridiculously similar to the Westy 12. When all is said and done, I don't think I could tell the difference if I was blindfolded. You could hand me an Abt 12 in a blank glass, tell me it was Westy XII, and I wouldn't be able to argue. That being said, they are both fantastic beers - pinnacles in brewing, and quintessential beers for the style they both represent. At the end of the day, I must give a slight nudge to the Abt 12 though, given it's relatively low price point and incredible availability. With ultimate succulent sweetness, robust wine-like tartness, and a gauntlet of flavors that reach the taste buds from multiple angles and with an array of characteristics, this is an epic beer for the ages! Delivered in a wide lipped, oversized bulb of a wine glass, adorned with the brewery's logo, this is the glass that deserves the beverage. The russet brown beer with burgundy hues carries a mild haze with a deep sheen. Tightly knit head character gives early impressions of thick blanket, yet late impressions are of a rich espresso-like creme. Fantastic retention and a generous allocation of sticky lace leaves intricate lacing patterns on the glass. A most inviting beer. Rich berry-like aromas are tart, savory, and vibrant. Backed by the succulent sweet notion of cotton candy, caramelized sugars, vinous wine-like character, orange peel, corriander, and grape, this classy ale courts the nose with pin-point seductive response. Flavors are much more concentrated than the somewhat tame nose suggests. Richly underplayed malts give a nondescript sweetness to the beer that when combined with alcohol delivers a deceptively light powdered sugar sweetness, slight chocolate, brown sugar, and elegant strength. Yeasty esters of grape, plumb, cherry, dates, figs, licorice, and apples all feed into the fruity complexities. Spicy notes replace hop bitterness with mellow white and black peppercorns, light smoke, and alspice with alcohol. Vibrant and bright, but not without the needed aged notes to suggest maturity, this fresh version satisfies just fine. Rich and succulent, the first sips give a medium creamy notion but a dense weight to the tengemental senses before making a procession across mid palate and marching toward sweet warmth, semi-sweet finish, and a sultry aftertaste of fruit, alcohol, and whimsy sweetness. This is a masterfully crafted ale that seduces the seneses with each and every sip. Keeping stride with the Westvleterens and Rocheforts, this beer plays no such second fiddel. Garnet red with plenty of haze. A thick puck of light tan head shows great retention. Wide and sticky legs of lace rim the sides of the glass. It's a hardy, deep looking beer. The nose really takes its time opening up as it warms. There's a rich vinous quality to it. Sour cherries and sweet booze drenched raisins. Ripe plums and dusty chocolate. There's a surprisingly lively ripe berry character that's really amplified by its alcohol level. Its very intriguing and complex as it slowly unravels. There's a sweet phenolic tinge to its alcohol character that paints the entire palate. On top there's the same ripe berry and raisins. Sticky toffee sits in the center. There's a lot more caramel and bread. The richness from the nose carries over into the taste and it lingers. Full bodied, slick and residual. Its drinkability is worth noting at 10% ABV. An excellent, unobtrusive level of carbonation. This reminded me of how complex a beer can be. I loved how it gradually transformed as it got warmer. There's plenty of flavors that kept my interest until I finished the bottle. I'm still learning to love the style but this is fantastic stuff. Look - Beer foamed slightly upon opening. Poured into snifter. Slight head that lingered for a minute or two before settling in to lacing. Beer was reddish brown leather in hue. Almost looked like fruit was soaking in it and then removed. Smell - Mmmm. Lots of raisins, dates, a little stone fruit and some booze. You could anticipate what was coming next. My mouth actually watered for this. Taste - Again, mmmmm. Raisins, dates, bready malt, slight hint of booze. Mouthfeel - Nice. Creamy. Carbonation light and does not get in the way. Each sip lingers on the palate. Overall - This beer blew me away. Absolutely beautiful beer. Can't wait to go deeper into this style. Had this side by side in a blind taste test with 5 other high end quads. As in any blind test scores were given before beer was revealed. I was very surprised I scored this so low, but it was the worst one I had that night. Another taste may be required. Ordered this on tap at a very good Belgian Beer Pub in Atlanta. Very true to the Quad style. Just a superb beer....if you haven't had this yet, make it happen. The flavors, warmth and mouthfeel really are what makes this beer. Do not underestimate it's power. This is a naptime inducer. One of the first craft beers I had. I had no idea what to expect on that one, simply it was tagged to check my beer list. I recall it was a shock; it was very much different to main stream and other more regular ales. Back then I had both Abt.12 and Rochefort 10 at the very same day. I recall well, I preferred the former. I would do the same experience this weekend. This one I have been cellaring for 3 years. Now on to the beer. It poured a hazy brown color with a thick dark beige head with good retention. Nice aroma with notes of creamy chocolate, prunes, figs, mild vanilla, some banana, cinnamon and red wine (without the alcohol). Delicious flavor with notes of chocolate mousse, cocoa, lots of spices (cinnamon, ginger, cloves, white pepper), plums, mint, figs, molasses, grapes, noble hops, pear juice, some banana, candi sugar, raspberries, coconut, blueberries, licorice and black currants. Amazingly no evident booze, just some Brandy flavor. Dry aftertaste with a medium bitterness. Full body with appropriate carbonation of tiny fellows. Neither syrupy nor heavy. Alcohol of 10% abv is superbly well hidden. I love this beer, utterly satisfying. It is very complex and still the myriad of flavors are subtle enough not to overshadow each other. It does not fell heavy at all; you don’t have to sip very small quantities at a time. I see this at the same level of the Westvleteren; I still need to drink both with the same aging and at the same time to state which one is better. Recommended. Appearance is mahogany brown crowned by 2" of creamy tan head. Retention and lacing are excellent. Smells of fresh kimi dipped in cherry sauce; banana bread wrapped in terry cloth; cloves; and organic cacao powder. Taste follows with a candy-like sweetness that finishes just a tad dry. Pretty drinkable despite the abv, but I could feel the alcohol warming presence almost immediately. A stalwart for the style, and one worthy of seeking. Enjoy. Holy Mother of St. Bernardus! 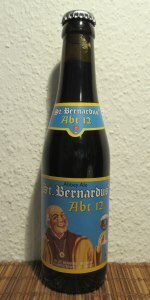 I’ve finally got my hands on a bottle of St. Bernardus Abt 12. This one comes from the greatest bottleshop in Australia, aka Plonk (in Canberra folks), I asked for it and they got it in (I love those guys!). Well this has been one at the top of my list for ages, isn’t it great when you finally get to topple giants? Anyway without further ado (I hate ado’s) let’s crack open some Abt 12. Poured from a 750ml bottle into a St. Feuillien chalice as it is the glass that compares most to the one on label, plus how happy does that monk look? I want to look that happy. A: Cloudy, with yeast particles everywhere, deep ruby ( and I mean really really really deep ruby) body with a 1cm fawn head that stays like a champ. 10/10. S: First whiff is a combination of dark fruit (plum, fig, date) esters and white wine spirit. Further notes of heavy bread yeast, brown sugar and a hint of peppercorn is revealed afterwards. That touch of wine spirit is the only disturbance to a perfect score. 9/10. T: One massive dark fruit experience! With added bold characters of brown sugar, rye bread and alcohol warmth at the back. There is a light medicinal hop note providing a hint of bitterness to cut through the sugar, and a slight peppercorn spice plays in to the flavour as well. What’s amazing about this brew is how flavoursome it is at 10% ABV. A buttery diacetyl opens up as the glass warms. Damn these monks in their fancy cassocks can brew! 10/10. M: Medium bodied with velvety smooth carbonation, it paints a rich tongue-coating tapestry throughout the mouth, mmmm. 10/10. D: Well the points are flying left right and centre for Abt 12, and so they should be - this is one brilliant Quad. Better than Trappistes Rochefort 10? Yes, this one has a touch more character in the flavour. As Doc (i.e. me, I’m doing a Caesar referring to himself in the third person thing now) always says: “The T in my reviews is king”. Indeed it is with the Abt 12. Let’s talk about the cons of this fine Ale: None. No wait, if you’re the designated driver going to a party and they’re serving bottles of this you might end up driving home drunk, getting caught and having your licence suspended... that is however a very specific and unlikely scenario (err, someone serving Abt 12 at a party that is, not the drink/driving part). 10/10. Food match: Some Trappist cheeses would go down a treat along with crusty bread. Poured from a 750 into a bolleke goblet. L- Dark brown, and clear with a big, fluffy, off-white head. Pretty good lacing. S- Very aromatic, thanks to the head. Prunes and raisins, with alcohol evident. Fruity alcohol aromas are here, not just esters. There's also a brown rumminess, probably from the Candi sugar. T- As the smell, with fruit and maillard (is this kettle caramelized?) up front. There's an acidity here that keeps good balance, and it finishes dry, just like it should. There's more of the rummy, brown sugar flavor in the end at the same time. F- it's weird when a beer is both effervescent and creamy, but I wouldn't sacrifice either. The fizziness and heat keep everything in check. O- Superb, and a good study in how conditioning technique impacts a beer. In my opinion, a better execution of style than WestyXII, and at nine bucks a bomber (thanks, LCBO), a steal. 750ml bottle poured into Sam Adams pint glass. Pours a deep, rich brown with two puffy fingers of tan head that leaves a thick horizon of rocky lace as it recedes. Smells of caramel tarts, fig, raisins, toasted brown sugar, preserved peaches, spiced rum, candied nuts and dried vanilla. Tastes of toffee pudding, chocolate ice cream, pecan pie, raisins soaked in spiced rum, candied walnut, browning banana and more oaken vanilla notes. Feels big and creamy. Full bodied with smooth, but active carbonation. Finishes off-dry. Verdict: Vigorously recommended. Incredibly good. A: 4.5 Pretty standard looking quad. Fairly hazy, reddish brown with a lacy, light tan head. S: 4.5 Textbook quad right off the bat with lost esters, mostly bringing roasted banana and clove. Some salted caramel works its way in as well followed by toffee and dried cherries. T: 4.5 While the nose is a touch muted and pretty standard for a quad, the flavor is where things really open up. It has the same qualities as the nose (as do most good quads), but there’s also a darker, earthy component that really compliments the sweeter, caramelized flavors. It’s endlessly complex making it a joy to drink. The only flaw is that it’s a touch boozy on the finish. M: 4.75 Great body and perfect carbonation with a slightly tannic finish. O: 4.5 One of my favorite quads, right up there with Chimay and Rochefort and maybe even a bit better. Perhaps my favorite quality of this beer is how much it develops as it warms, much like a great stout; excellent right out of the fridge, but gets better every minute. This is my default go-to malt bomb if it's offered on tap. Strongly prefer draft to bottled where this beer is concerned. Rich, decadent, mysterious and readily available. Also makes one hell of a ice cream float for dessert. Sitting in a hefty brown bottle, we loosened the old fashioned cork, releasing a symphony of rich fermented aromas. The label jumps off the bottle in a bright blue and yellow with the picture of a Belgian fryer raising a glass in approval. On the back, a wonderful description of the St.Benardus Brewery as well as an overview of their traditional brewing process. Sitting by a warm fire, we poured to chilled chalices full of a smooth, weighty, deep amber/brown beer. A nice full head, full of large bubbles releasing more intoxicating aroma of baking bread, malt, and fig. Raising the glass to our nares the intense complexity of the Abt 12 begins to come alive with a bright and grainy scent that filled the olfactory with pleasure. Swigging a mouthful, the tastes of bread pudding, caramel, grains, and a hint of hops rush across the tongue in tidal wave of flavor. As we settle into the beer a pleasant, medium viscosity mouth feel is established, followed by a potent yet refreshing balance of banana, toffee, and dried fruit ester. At 10% ABV, the Abt 12 packs a hearty, warm rush in less than 12oz. Nearing the bottom of the chalice, with plenty of head still chasing the beer down the glass, the taste of black current swirls with a mixture of fresh farmhouse scent, leaving us both satisfied a mildly drunk. It is a fantastic beer for anyone hoping to enjoy an authentic, high quality Belgian beer, that would make an Abbey proud. Poured into a St. Bernardus glass. Look: Burnt cinnamon colored body under a frothy, foamy cream colored head. Great retention. Lovely foamy bands of lacing. Aroma: Bready malts, dried fruits, apple, cinnamon. Taste: Much like the aroma -- so spicy, fruity, and bready. Lovely malt bill. Dried fruits. Boozy, dry finish. Mouthfeel: Dry, not as heavy as ABV would suggest. Overall: Excellent. Great taste profile, looks great, smells great. Becoming one of my favorite styles. Lightly chilled and poured into a Duvel glass. Glass of cold water on the side to sip from periodically. The date code is blurred but this should be from a September of 08 bottling. Appearance: Upon opening the bottle the beer foams up out of the bottle mouth and into the glass. The beer pours a dark brown with reddish undertones and a 1 ½" light tan head that quickly fades leaving a ring around the glass, lots of small speckled lacing and a thin layer of foam on the liquid. Sipping consistently leaves lacing. Smell: The aroma contains bready notes, hints of yeast and sweet candi sugar. There is also a component of dark caramel malt or carmelized sugar with some dark fruits (plum, raisins). I don't tire of this aroma and it seems new and fresh every time. Taste: The flavor contains sweetness and hints of bitterness with flavors of plum, malt and raisin. There is some vanilla in here and a slight hint of alcohol. But the impression is of a dynamic balance, with flavors bouncing back and forth over the back of the tongue but without any one flavor becoming dominant. Mouthfeel: The mouth feel is medium bodied with light creamy carbonation. The finish is medium long, lightly bitter and dry. Drinkability: This complex beer is quite nice for sipping and the aroma and flavors almost seem to become even more complex with time. But one does not tire of them as is the case with some beers. At 10% ABV this is a one a night beer, but one I'll be revisiting in the future. This is one beer that illustrates why drinking beer can be a true pleasure. Presentation: Poured into an appropriate chalice at 't Brugs Beertje in Brugs, Belgium. Appearance: Dark brown in colour with a sticky creamy off-white head. Taste: Full-bodied, smooth and creamy mouthfeel. Rich and malty with a semi-grape sweetness that mingles in with some dark ripe fruity esters. The alcohol is very apparent, warming as hell! Notes: Sheer bliss. Viewed as an abbey beer. According to Daisy (owner of 't Brugs Beertje), this beer follows the same recipe, uses the same water and its hops comes from the same hop regions as Westvleteren. "Abt" means the "highest rank." They also make a "Prior" at about half the strength. I was not a fan of this one at all. I am not a huge fan of quadruples so I should not have been surprised that I did not like this. I would not recommend it. This was poured into a chalice. The appearance was a dark brown close to black color with a slim finger’s worth of head that quickly dissipated. There wasn’t much lacing. The smell had some sweet dark fruits - fig, raisin, prune with a light touch of warming cocoa. Light breadiness with some Belgian spices round it out. Light sweet apple comes in nicely. The taste was moderately sweet with the breadiness gracing in and around the previously mentioned flavors. Gentle sweet to spicy aftertaste slides into the finish. That "deep throatiness" I normally get seems to be contained a bit, really nice. On the palate, this one sits about a medium on the body in the front of my tongue but seems to get that "heavier" feel as it runs to the back of my tongue. Still good. Carbonation runs at a nice pace. Overall, now this is a Quad. I’d most likely say, the quad of quads, uh...hell yeah, definitely would have again. Poured into a chalice from a bottle less than a year old. Aroma is sweet with notes of fig, nutmeg, and cinnamon. Taste is initially sweet and a little bitter, this is followed by dried fruit (figs, raisins). The finish is creamy with a some alcohol warmth. Afterwards there is a lingering taste of dried fruit and carmel. The mouth feel is fantastic; bold, rich, yet creamy and smooth. You can tell it has some alcohol but there isn't ever an alcohol "bite". This is a rich complex beer worth trying. I would image it only gets better with a little age. Murky brown pour, still with good clarity under cap; thick tight beige head; long lasting cap; heavy lacing. Dark stone fruit and caramel malt aromas followed by spice and lite clove as liquid warms; add banana and caramel candy nose. Flavors of figs, prunes, caramel malt, chocolate syrup on banana middle; dark cherry cordial yields to lite clove, tobacco and fudge finish. Medium plus mouthfeel and medium carbonation. A world class quad - complex tapestry of fruit/yeast/malt and candy flavors. L: Poured into a chalice. Dark ruby/amber depending on light. Two fingers of rocky tan head that laces in clumps as it dissipates. It's gorgeous. S: Banana, citrus, dark fruit (raisins, cherries), hint of malt, some booziness, finish is reminiscent of cider or sparkling wine. T: Malt, raisin, very light toffee, notes of banana, raisin, plum, and cherry. A touch of hops that rounds out well. Brown sugar permeates the experiences as it is finished off with a not of yeast and booze. Just a tad bit of vanilla and spice (clove mostly). As it warms you get hints of banana and more breadiness. So incredibly well-balanced. F: Medium bodied by way of carbonation. It gets thicker the more it warms. It coats the mouth a bit and the alcohol warms very pleasantly. Excellent carbonation. Another reviewer noted that it isn't cloying, which gets it spot on. It balances well, and comes out so very smooth. O: This is a phenomenal beer, and quite possibly the best quad I've ever had. Incredibly easy to drink. Too easy for 10%, honestly. Immaculate is the only word I can use to describe it. I'm disappointed it's taken me so long to get hold of a bottle, and I'll be getting more to keep around. You owe yourself to try this. Appearance: Large, moderately coarse tan head crowns a mahogany brown body. The head retention is excellent, the lacing thick and glass wail coating. Aroma: Rich dark bread notes and sweet, spicy alcohol dominate the aroma, there are slight dark dark fruit notes, but the malts and alcohol dominate. Taste: Opens with an abundance of toasted malts, dark fruit, and slight sweet alcohol. As the taste progresses, earthy yeast flavors present, and there is a moderate caramel sweetness, although throughout, there is a toasted dark bread presence. The alcohol is extremely well concealed, presenting only subtly. Finishes with a lingering presence of toasted malts and caramel. Mouth feel: Smooth,rich and full, with soft carbonation. Drinkability/notes: Simply excellent, no wonder its one of the highest rated beers on BeerAdvocate. Presentation: Packaged in an eleven-point-two ounce Euro-style brown glass bottle sealed with a pry-off crown, served in a New Belgium Brewing chalice.